I wrote an earlier post about Charles Lummis and "The Bibliosmiles", an organization designed by group of librarians who probably had too much time on their hands at the 1906 American Library Association Narragansett Pier (RI) Conference. In doing some research on ALA's centennial I came across "ALA Centennial Vignette No. 9" in American Libraries for February, 1976. The vignette was about the Bibliosmiles and was written by Ed Gleaves, at the time Director of the School of Library Science at George Peabody College in Nashville, TN. Gleaves wrote about the first meeting of the Bibliosmiles at the 1907 ALA Conference in Ashville, NC where the organization was officially founded. The organization's motto was "To keep the Book Dust off our Top Shelves" and its password was, "Cheer Up, ALA". Their official seal is shown to the left. The officers, who included some heavy hitters in ALA, gave themselves some interesting titles: John Cotton Dana was the Grand Ha Ha; Tessa L. Kelso was Minehaha; W. P. Cutter was Sardonic Grin; Adelaide R. Hasse was Big Stick; Samuel S. Green was Supt. of Edification; Joseph F. Daniels was Glad Hand; F. K. W. Drury was Subdued Snicker; E. L. Pearson was Main Guy; and Charles F. Lummis was Grim Reality. Grim Reality spoke first at their meeting at the conference according to Gleaves - "Mr. Chairman: In our profession, even more than in most, we must accept Civilization. In our profession, as much as in any, we need to take it with reservation .. We have to catch, ourselves young, and organize against the Habit of Huddling... The whole tendency of civilization is to run together in an indistinguishable mess. We must Get Together, to Keep ourselves Apart... ." Later in his presentation Grim Reality makes a surprisingly serious point for an organization founded in humor, "I wish to call your attention further to the fact that, while ladies have their full share of library positions, they have never been admitted to those serious and subterranean councils in which the real fate of the ALA is determined. With the highest regard for the generic wisdom of this convention, I respectfully submit that there ARE women fully worthy to share our efforts to retain humanity in the libraries... ." In an essay titled "Adelaide Hasse: The New Woman as Librarian" in the book Reclaiming the American Library Past: Writing the Women In edited by Suzanne Hildenbrand (Ablex Publishing, 1996), Clare Beck wrote the following about the participation of Hasse and Kelso in the Bibliosmiles: "Among librarians, Hasse and Kelso's liveliness stood out to an extent that they were chosen as two of the three women members of the Bibliosmiles, a mildly rowdy organization founded by their old friend from Los Angeles, the flamboyant Charles Lummis, as a refuge from the solemnity of ALA meetings. The Bibliosmiles, 'Librarians who are Nevertheless Human' dedicated to 'keeping the dust off our top shelves,' specialized in comic songs and speeches, but the group was also a meeting place for some of the iconoclasts of the library world, men like Lummis and John Cotton Dana, who thought highly of Hasse and reinforced her belief that libraries could be a vital and innovative part of progressive change." 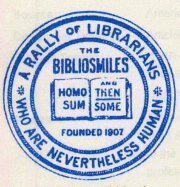 Gleaves notes in his article that by 1911, "The Biblioshmiles, being human, were soon to pass into history, and with them went their dream of laughter, their irresistible protest against undue solemnity in the profession of librarianship. A rally of librarians to be remembered, they are largely forgotten - the final grim reality." And so, lest we forget. Hello! Say, where did you get that Bibliosmiles seal? Was it reproduced in the American Libraries vignette? Thanks!